Installing lights on your house can be an annoying experience, especially when using accessories that seem to keep breaking or loosening to make your display appear uneven in places. Following our guide on an easy way to hang Christmas lights on a house, you will be able to see which products match different accessories, and should give you a clear idea of how you can go about making your house stand out from the rest this Christmas! Using the gutter as a tool to hang lights from is an extremely popular way for people to easily and quickly install lights at Christmas. 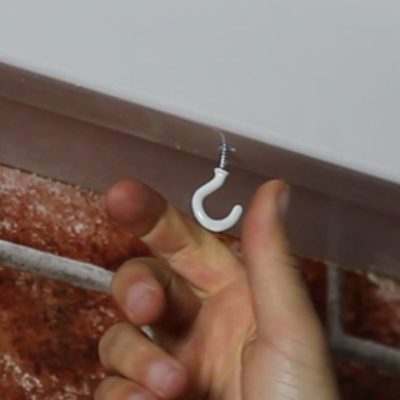 A simple pack of gutter hooks would be all that you require from which to begin setting your display up and we offer these in both a clear and black option. We would recommend that some of our lighter items are installed this way, as too much pressure on the gutter could result in either the gutter giving way or the clip falling off. Whilst silhouettes may be too heavy, icicle or curtain lights would work perfectly. The drop down nature of these lights is also perfect for gutter installation, as this will generally mean they hang down stylishly over your windows. 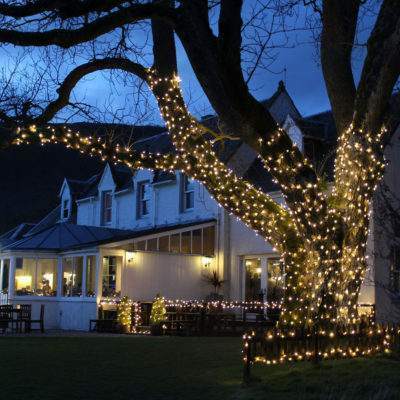 Here is an example of icicle lights being hung from gutter hooks to create a beautiful effect. In the second image is the gutter hook itself. As you can see, it was easily and safely attach on to gutters. When it comes to using your house wall for hanging purposes, then you will normally have a much wider range of products to choose from. By easily screwing installing our sturdy cup hooks into your house wall, your choices to illuminate your house are literally endless! Almost all of our silhouette range will work, and these deceptively strong hooks will hold them in place with the minimum of fuss. Our festoon lighting would also be an option, as the belts themselves will be considered too heavy normally for gutter hooks. The cup hooks themselves will leave only a tiny indent once removed; a small price to pay for such fantastic decoration choices! Whilst the first picture may be an extreme example of silhouettes , it has used cup hooks to great effect. 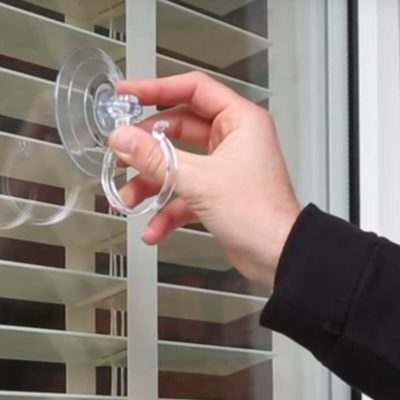 In the second it shows how a cup hook is installed by screwing into the house. It is something that many people like to use in understated displays, or to provide a centre piece as people come up towards your house. 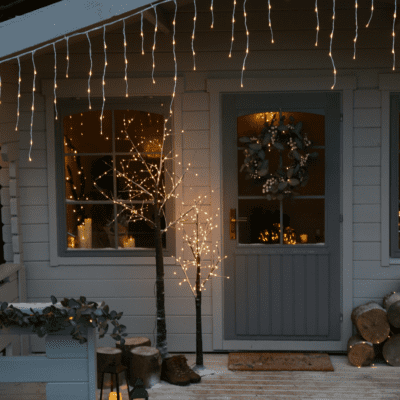 Installing an item such as a star or a snowflake can really emit a traditional homely feel on your property, or even by simply running fairy lights around the window edges. Our how to run lights around a window guide will explain everything in more detail for you!